We just got back from a long weekend in Devon celebrating our two year wedding anniversary (!). 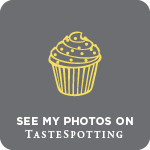 As with most celebrations in the Little Loaf household, the trip revolved around food; more specifically the food from Michael Caines‘ two Michelin starred restaurant at Gidleigh Park. Aside from a three hour trek over Dartmoor (it was meant to be two, but these particular Londoners don’t fare so well out of Google map reception) we spent the rest of the weekend cosied up inside, being fed with exquisite dishes that brightened up even this drizzliest of British Bank holidays. I won’t go into every detail of the menu, but some of the highlights included apple mousse topped with green apple jelly, sorbet and a vanilla foam, limitless supplies of five types of freshly baked biscuits in the ‘Pantry’ next to our room and white chocolate ‘candles’ with chocolate, rose and raspberry mousse. The savoury dishes were also out of this world and the service second to none, so if you’re ever in that part of the world, I couldn’t recommend Gidleigh Park highly enough. The journey from London to Devon takes around four hours, so I packed these little empanadas as snacks. Stopping at a motorway service station for food isn’t ever going to be part of a romantic weekend away in my book, but perfectly portable little pastries filled with squash and salty cheese tick every box. 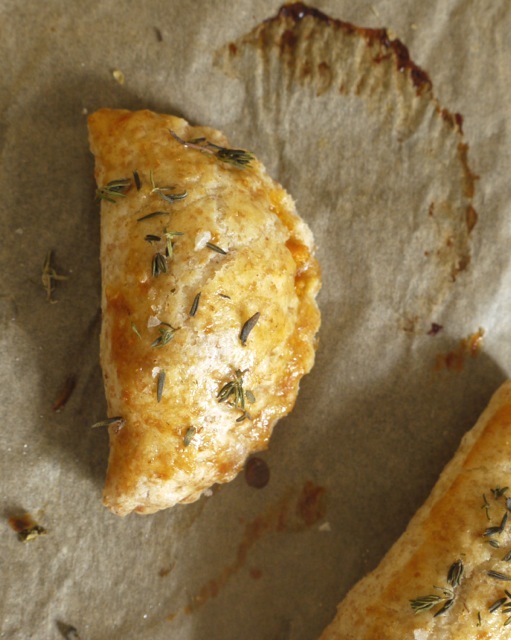 The recipe below is written as vegetarian, but I added leftover lamb and black olives to about half of the batch and often use this kind of pastry as a sort of fridge sweep, popping in bits of cheese or any meaty treats we might have going spare. So here we’ve come full circle, from being fed to feeding people again. 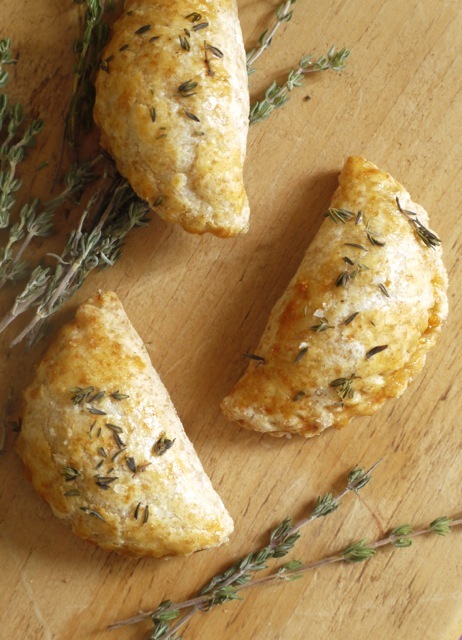 If you’re planning a party, a long car journey or a picnic on the moors, these flaky empanadas would be perfect. Share them with loved ones, eat plenty yourself, and here’s to the start of autumn. 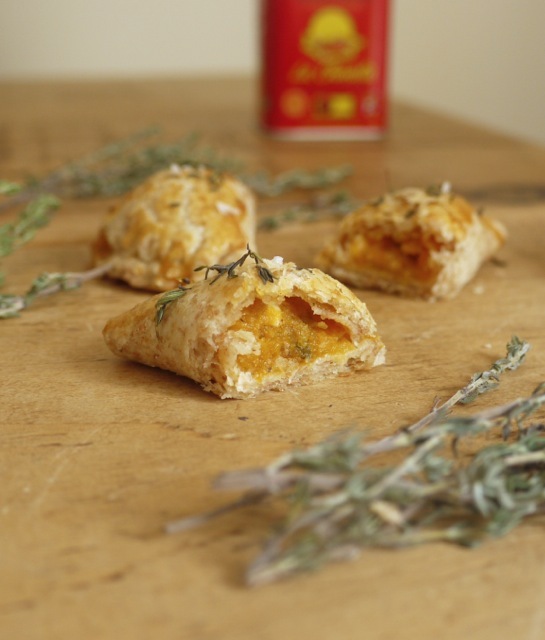 Flaky pastry pies holding a creamy squash filling with nuggets of salty cheese. These empanadas aren't entirely authentic (i.e. not deep fried) but they're delicious enough not to care. Depending on what you have in the fridge, the filling can be tweaked to incorporate leftover cold cuts of meat (lamb is delicious), pitted black olives or other types of cheese. To make the pastry, combine the flours and salt in a large bowl. Using a coarse cheese grated, grate the cold butter into the bowl and stir to combine. Add the vinegar and iced water, a tablespoon at a time, incorporating to a soft dough with flecks of butter. Knead a couple of times to combine then shape into a disc, wrap in cling film and refrigerate for 30 mins. To make the filling, scoop the roasted squash flesh out of its skin into a medium bowl and mash coarsely with the back of a fork. Squeeze the garlic cloves out of their skin and mash into the squash. Stir in the thyme and paprika then crumble in the feta and fold gently to combine. Taste the mixture and add salt and pepper as needed. Remove the pastry from the fridge, lightly flour a work surface and roll out to a thickness of around 3mm. Use a round or fluted cutter (I used 10cm round for small ones and 15 for large) to press out circles for your empanadas. Preheat the oven to 180 degrees C/160 C fan. 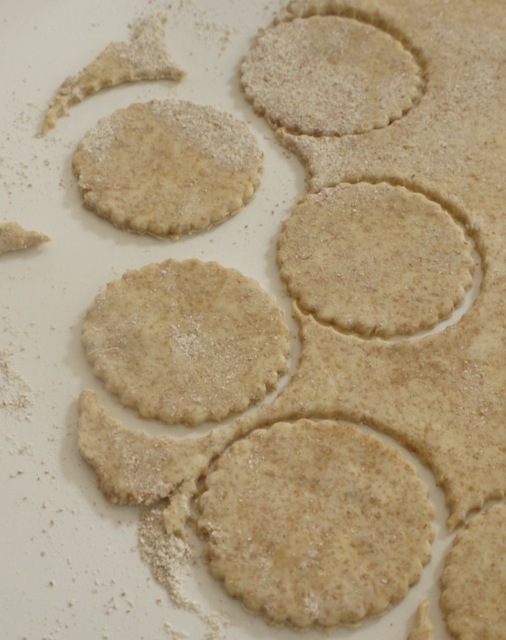 Scoop a spoonful of mixture into the middle of each circle, making sure to leave plenty of room around the edges. Brush one semicircle of edge with egg wash then fold over the other half to encase the filling, crimping the edges with a fork to hold it all together. Repeat until all your circles are filled. 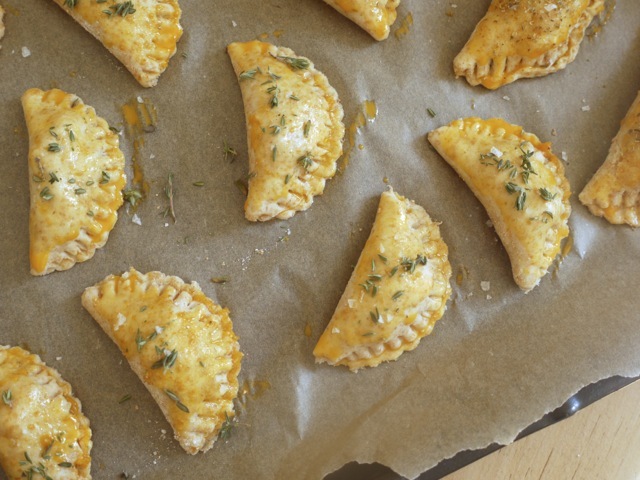 Transfer the empanadas to a baking tray lined with parchment paper. 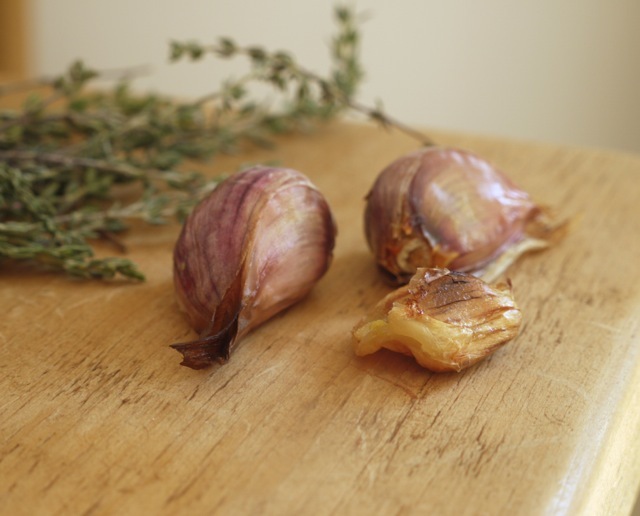 Brush all over with a little more egg wash and sprinkle with thyme leaves and a pinch of flaky sea salt. 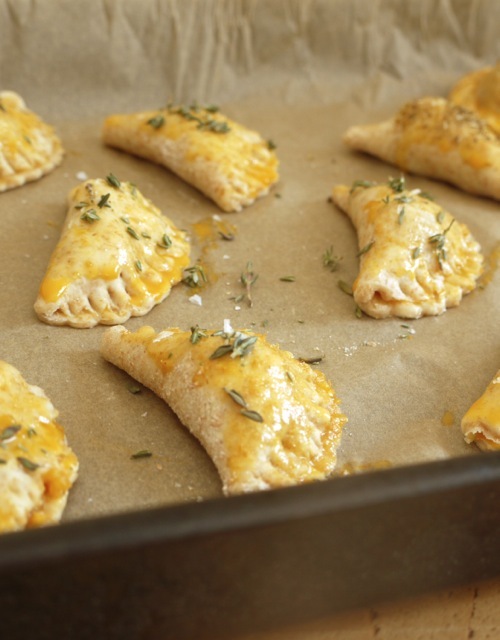 Bake for 20 - 25 minutes until crisp and golden - if you make your empanadas larger they may need a little longer. Remove from the oven and enjoy warm or transfer to a baking rack to cool completely. Perfect for lunch with a salad on the side, or to pack up and take on picnics. The empanadas will keep in an airtight container for a couple of days and can be reheated for 5 - 10 minutes in a warm oven. To get the butter for my pastry extra cold, I pop it in the freezer for 45 minutes before starting the recipe.